Crowdsourcing has come of age in the nine years since James Surowiecki’s The Wisdom of Crowds was first published. Clothing crowdsource sites BetaBrand and Threadless contain costs and maximize on the cool factor by only manufacturing the designs that have fan support. Kickstarter crowdfunding brought the Pebble smart watch and Goldieblox building toys into being. And since its launch, My Starbucks Idea has introduced 220 customer-inspired drinks and over 100 new food items. It’s clear that when a group comes together to conceive new ideas and prove untested concepts, innovation can reach new heights. 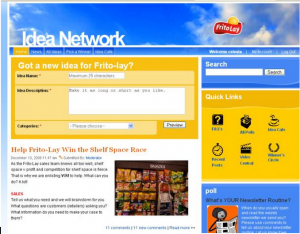 A few years ago we had the opportunity to work with CPG giant Frito-Lay on an employee-based crowd-sourced innovation community called The Idea Network. We originally conceived of the Idea Network as a place where employees could vote on product ideas in the R&D pipeline and build out the best ones. But after talking extensively with employees throughout the company—in finance, procurement, HR, sales, and operations, we found that many of them had great ideas for products and innovating the production process and they wanted a place to share those ideas. Tests with consumers showed employee-generated concepts from the Idea Network performed just as well as agency-generated product ideas, a real return on investment for Frito-Lay. And employees truly appreciated having a voice, and seeing their ideas come to fruition. 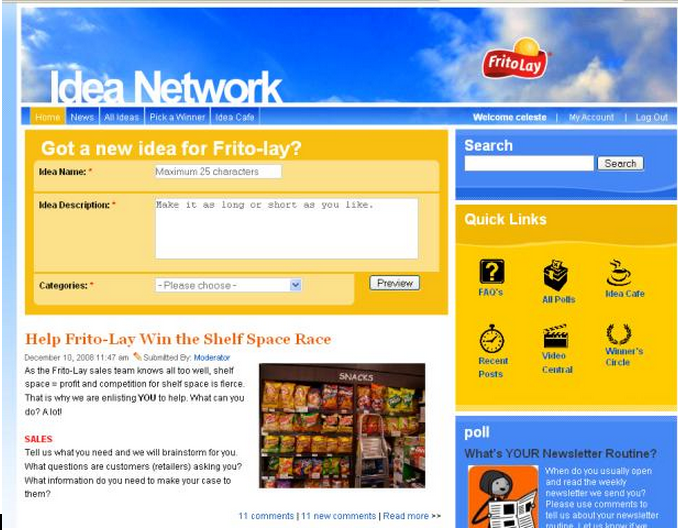 Over 80% of members said that the Idea Network made Frito-Lay a better place to work. These are just a few of the takeaways we had from The Idea Network. You can read the full case study here.